This easy snack ideas post is part of a campaign on behalf of Mom Central Consulting for ACH Food Companies Inc. I received a promotional item as a thank-you for participating. My kids went back to school last week and that means I am back to packing lunchboxes at 6 AM every morning. They are not real big fans of the school lunch program and I would much rather they bring a lunch from home anyhow. If you have ever eaten lunch at school with your kids you will understand why. The quality of the food in our school system leaves a lot to be desired! I have teens so I try to find foods to pack in the lunchbox that are healthy but also ones I know will get eaten. This usually means a balance between fruit and cheese sticks and cookies or whole grain tortilla chips. I am always looking for easy snack ideas that contain whole grains and protein to help keep them fueled up for a while. 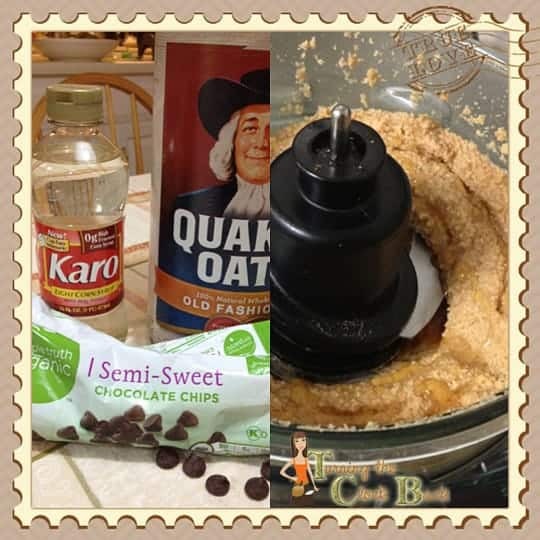 When I was asked to create a recipe using Karo Corn Syrup I spent some time browsing around on the website for easy snack ideas that I knew my kids would enjoy. 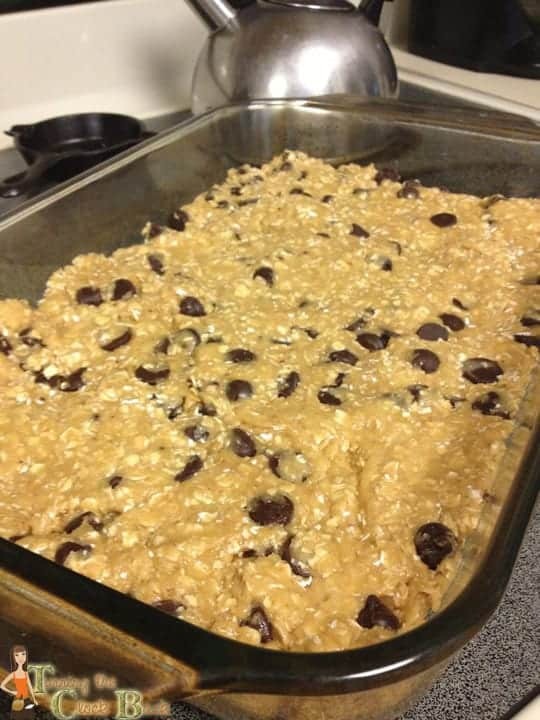 These peanut butter oatmeal bars contain lots of oatmeal for fiber and peanut butter for protein. I love bar cookies because I find them much less time consuming to make. No dropping 4 batches of cookies onto a cookie sheet…just spread the batter in a pan and bake. Yes, I am a lazy cook! I decided to make my own peanut butter for this recipe. Why? Quite simply because I was out of peanut butter and was too lazy to go to the store. I had a huge container of peanuts and a Ninja Mega Kitchen System and it took about 3 minutes to turn the peanuts into peanut butter. If you decide to give this a try, use unsalted nuts. I only had salted nuts and I think the cookies came out a little salty. But, they were still delicious! Karo Corn Syrup as the sweetener helps the bars stay moist and chewy. It has been around for more than 100 years and is the only widely distributed brand of corn syrup that contains 0 grams of high-fructose corn syrup. The first time I used Karo Syrup on my own was when I decided to make my first pecan pie. I had moved from New England to Texas when I was 22 and had never had a pecan pie. Karo syrup is a classic ingredient in this favorite southern dessert and it came out delicious! If you want to learn more about Karo syrup you can check out the Karo Syrup’s Facebook page and the Karo Syrup website. It also works really well in glazes for ham or in home made candies. It adds a bit of sweetness and gives a smooth texture to a number of recipes including desserts and main dishes. 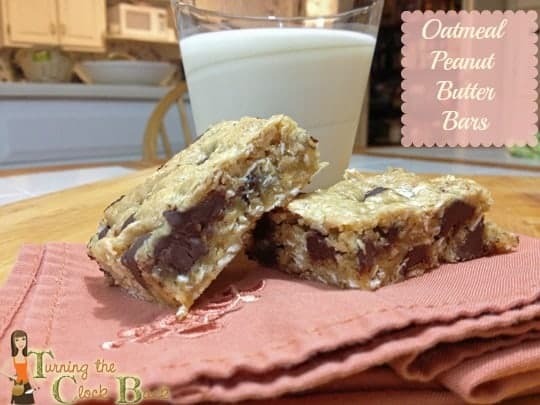 Full of chewy oats and protein rich peanut butter this is a delicious bar cookie if you need easy snack ideas. Preheat oven 350ºF. Stir together flour, oats, baking powder and salt in a small bowl. Set aside. Spread mixture in a greased 13 x 9-inch pan. Bake about 20 to 25 minutes, or until wooden pick inserted in center comes out clean. Cool completely on wire rack. Cut into bars. Store in tightly covered container. 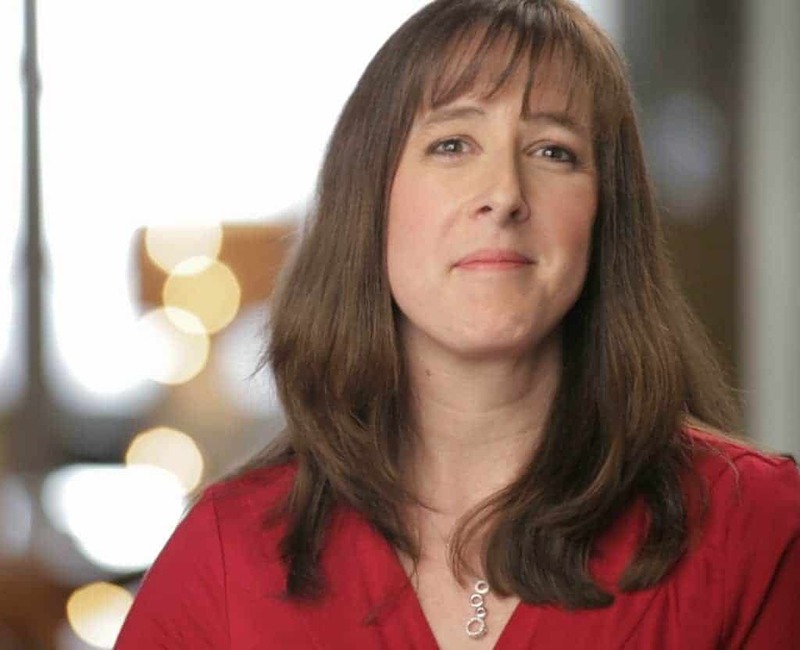 Disclaimer: I participated in a campaign on behalf of Mom Central Consulting for ACH Food Companies Inc. I received a promotional item as a thank-you for participating. That looks delicious. My kids love peanut butter anything!